Fast delivery. As described on website. Soft Mouton fir, looks great. Sheepskin is soft and looks really good, the stitching is straight and tight. The fit was good; but you need to measure your head properly and I recommend rounding up to the nearest 1/4" and getting that size hat. I bought this for my son but I think I'm going to get one because they look and feel really warm. If you like this style hat you won't be disappointed on the look and craftsmanship. Hallo! Finally I received the long awaited hat and I'm very excited! It took three weeks that I have received, because I am from Slovenia-Europe, but it was worth the wait! This hat is very beautifull and very varm, exactly as I wanted! It's also supreme quality made! I hardly waiting for colder weather to test it. And I will certainly buy something from you in the future! Web side is also very nice, keep up the good work! Thank you very much, Furhatworld team! A well-made, nicely finished hat, very good quality - I suggest you order one size larger than you think you'll need. FHW is a pleasure to deal with. Their web site is nicely designed. Their delivery is super-fast and they accept returns without hassles, for prompt, full refund. Their telephone service is courteous and helpful - exemplary! I'd be happy to order from them again. Best purchase in a long time! Great web site from product picture to hat size chart to secure log-in and ease of ordering. Top Quality product for a reasonable price! Hat was in stock, arrived with amazing speed. Fit like a glove and better quality than anticipated. WAY TO GO! A trip down to your local clothing store, and you will find that not much is MADE IN CANADA anymore (if anything). This stands out proudly Canadian. Well made and very original.... I ordered my hat at 12 noon on the 29th of Dec and I received it less than 24 hours later. That has to be the quickest delivery Ive ever experienced. Thank You Much! A superbly made quality product delivered swiftly - can't ask for more (except perhaps for another fur model to add to the wardrobe!). It's a real pleasure doing business with you, and a fine example of what a good internet company can and should be. Thanks. Great workmanship. I am extremely pleased with this hat, but I would not expect anything less from Canadian craftsmen. Shipment arrived on time and ordering was easy. Thanks for a great product. I will be ordering for my wife soon. Do not buy cheap imitations. This is the one and only. Warm, well made and great value for money. Even had drivers looking at me walking the dog. Certainly not my good looks, it was the hat!!!!! My Trapper Hat is work supreme of art. Detailed craftmanship is what made me place another order, and will make me a valued customer. I didn't know the quality of work done north of the boarder. Keep up the good work, and you'll keep my business. I have been looking for this hat for many years. Great hat. I can't wait for it to get cold. This is my third purchase from FurHatWorld. Great service. 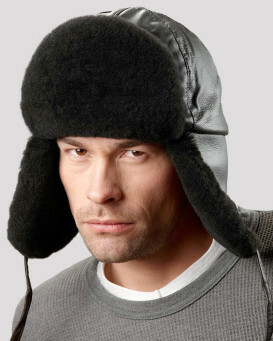 Excellent, warm and comfortable winter hat. Great value for money. The customer service at FurHatWorld is very nice. I already know what next hat I will buy next winter. Thanks! Just received my hat yesterday! The quality and workmanship are second to none! A fine example of our talented craftspeople in Canada! Thanks again, will shop on your site in the future! thankyou for a good fast service and good quality hat. Very impressed. Hat is very warm and comfortable, great value for the price. Excellent service and value for money. Brilliant hat, warm and stylish not available anywhere else and only 12 days for delivery to my front door. Great hat. True quality. Will keep you in my favorites. Love this hat. Very warm and excellent quality. Received order within 1-1/2 weeks. Will order from Fur Hat World again. Excellent transaction throughout and perfect item for the winter.Will definitely deal with again. Great service, excellent product. This hat is supremely warm and it was delivered within a week of ordering from Canada. Thanks.